GETTYSBURG, Pa. (January 28, 2018) — OPEN MINDS announced Core Solutions, Inc. (Core) is now a silver partner for the 2018 OPEN MINDS Executive Institute series. Highlighting Core Solutions’ partnership package will be two knowledge partner sessions at the upcoming 2018 OPEN MINDS Strategy & Innovations Institute and the 2018 OPEN MINDS Technology & Informatics Institute. More details about Core’s knowledge partner sessions at the 2018 OPEN MINDS Strategy & Innovations Institute and the 2018 OPEN MINDS Technology & Informatics Institute will be released in the coming weeks. Core Solutions, Inc.(Core) is a national provider of behavioral health EHR solutions. 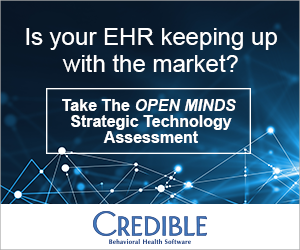 Core strives to make value-based healthcare more effective for behavioral health organizations and their consumers by leveraging the expertise of its visionary leadership team to offer a consultative approach and configurable EHR solutions. Core’s EHR, Cx360, is built to evolve alongside changes in healthcare to enable consumer-centric, whole person care. Learn more at http://coresolutionsinc.com/.